What do the Andes Mountains and the Appalachians have in common? The Cerulean Warbler! In winter, the Cerulean Warbler forages in tree-tops of the Andes Mountains. In May, at the other end of a 2,500-mile migration, the very same bird sings from the tree-tops in the Appalachian Mountains. The Cerulean Warbler is one of the most threatened birds in the US. American Bird Conservancy is working to save this bird and its two homes. ABC presents a roadmap for conserving birds in the Americas in their book, The American Bird Conservancy Guide to Bird Conservation. Choosing shade-grown coffee can help save the Cerulean Warbler. As the sun rises on a January morning, a little azure bird forages in the tree-tops of the Andes Mountains in Colombia. Back in May, at the other end of a 2,500-mile migration, the very same bird sang from the forest canopy in the Appalachian Mountains. The bird, named for its sky-blue plumage, is a Cerulean Warbler. [Cerulean Warbler song] Its story links conservation efforts in Colombia’s coffee country with those in the coal-mining regions of Appalachia. 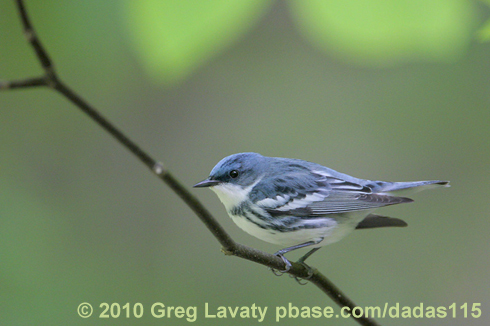 The Cerulean Warbler is one of the fastest declining songbirds in America. Since the 1960s, its population has plummeted by more than 70%. But an international conservation effort is under way, led by American Bird Conservancy and their Colombian partner, Fundación ProAves. A sanctuary called the Cerulean Warbler Bird Reserve was recently established in Colombia. And a program is under way to restore Cerulean Warbler breeding forest habitat on former mine lands throughout the Appalachians. Preserving and restoring forest habitats at both ends of its range is essential to the warbler’s survival. If you purchase coffee grown in the shade, tip your cup to the Cerulean Warbler! You’re using your power as a consumer to turn the tide. Learn more at birdnote.org. Song of the Cerulean Warbler provided by The Macaulay Library of Natural Sounds at the Cornell Lab of Ornithology, Ithaca, New York. Feature recorded by W.L. Hershberger 85100 [CD 65 T7] with G.A. Keller recording in background. Migratory birds and shade-grown coffee - Learn more from the Smithsonian!